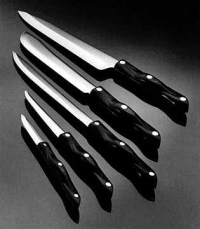 In 1952, this line of cutlery was introduced into its Cutco product line by Alcas, a subsidiary formed by ALCOA and Case Cutlery in 1948. It featured the first scientifically-designed ergonomic handle known originally as the “hand perfect” handle and later as the Lamb Wedge-Lock handle (“It wedges the fingers apart and locks the thumb and fingers on place”) by Thomas B. Lamb, who started the handle design in 1941, studied 700 pairs of hands, patented the concept in 1945, and first exhibited it in 1946. In 1948, Lamb’s handles were featured in an exhibit at the Museum of Modern Art, and in 1954, featured articles about Lamb and his handles appeared both in the New Yorker and in the very first issue of Industrial Design magazine, giving him wide visibility. The design became known as the “Lamb Handle,” and Lamb, as the “Handle Man.” Versions of it were designed and licensed by Lamb for manufacture on pots, pans, hair dryers, bayonets, gavels, kitchen tools, squeegees, surgical instruments, suitcases, sickles, spoons, screwdrivers, police clubs and hundreds of other products. Thomas Babbitt Lamb (1897-1988) was born in New York City and, while working as a textile designer (he started at age 13), studied at the Art Students League and New York University, later establishing his own office in the textile design field. He also wrote and illustrated children’s books in the 1920s, and had many cartoons published. He had a monthly page in Good Housekeeping magazine called “Kiddyland Movies” which spawned a line of children’s products. Early on, Lamb became fascinated with hands through drawing and studying their anatomy while creating medical illustrations for surgeons. During World War II he developed an improved crutch arm-rest concept for crippled soldiers. Through subsequent intensive user research of hand forces, angles, curves and finger strength, he perfected his invention of the efficient and comfortable ergonomic handle for which he became well-known. Lamb improved the original handle design in 1973 which became the “Universal Wedge-Lock” handle, designed to be rotated or held in any position and still fit the hand comfortably. Today, it is still an integral design feature of all cutlery made by what is now Cutco/Vector in Olean, NY, and which is available from that company at 800.633.8323. Photo is by courtesy of Cutco.